Game or quarry is any animal hunted for sport or for food, and the meat of those animals. The type and range of animals hunted for food varies in different parts of the world. Game or quarry is any animal hunted for its meat or for sport. The term game arises in medieval hunting terminology by the late 13th century and is particular to English, the word derived from the generic Old English gamen (Germanic *gamanan) "joy, amusement, sport, merriment". Quarry in the generic meaning is early modern (first recorded 1610), in the more specific sense "bird targeted in falconry" late 14th and 15th centuries as quirre "entrails of deer placed on the hide and given to the hunting-dogs as a reward", from Old French cuiriee "spoil, quarry" (ultimately Latin corium "hide"), but influenced by corée "viscera, entrails" (Late Latin *corata "entrails", from cor "heart"). Wild game meat (usually considered to include animals harvested from game reserves) is generally considered to be superior in nutrient density, and usually has lower fat content, than meat procured through contemporary farming methods, while the cost in time and money to procure wild game is much higher. Small game includes small animals, such as rabbits, pheasants, geese or ducks. Large game includes animals like deer, moose, and bear. Big game is a term sometimes used interchangeably with large game although in other contexts it refers to large, typically African, mammals (specifically "big five game" or "dangerous game") which are hunted mainly for trophies. The type and range of animals hunted for food varies in different parts of the world. This is influenced by climate, animal diversity, local taste and locally accepted views about what can or cannot be legitimately hunted. Sometimes a distinction is also made between varieties and species of a particular animal, such as wild turkey and domestic turkey. Fish caught for sport are referred to as game fish. The flesh of the animal, when butchered for consumption is often described as having a "gamey" flavour. This difference in taste can be attributed to the wild diet of the animal, which usually results in a lower fat content compared to domestic farm raised animals. In some countries, game is classified, including legal classification with respect to licences required, as either "small game" or "large game". A single small game licence may cover all small game species and be subject to yearly bag limits. Large game are often subject to individual licensing where a separate licence is required for each individual animal taken (tags). Some of these animals are endangered or otherwise protected, and thus it is illegal to hunt them. In Africa, animals hunted for their pelts or ivory are sometimes referred to as the big game. Also see the legal definition of game in Swaziland. In the PRC there is a special cuisine category called ye wei, which includes animals in the wild. Capercaillie are not currently hunted in the UK because of a recent decline in numbers and conservation projects towards their recovery. 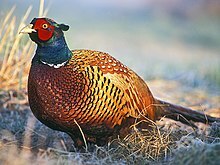 The ban is generally considered voluntary on private lands, and few birds live away from RSPB or Forestry Commission land allegedly. Moose, Alces alces. Moose hunting season in October is close to a national pastime. Game meat is typically taken from a wild animal that has been shot with a gun or bow. Hunters must be absolutely certain of their target before shooting and should make every effort to get the animal down as quickly and painlessly as possible. Once obtained, game meat[clarification needed] must be processed. The method of processing varies by game species and size. Small game and fowl may simply be carried home to be butchered. Large game such as deer is quickly field-dressed by removing the viscera in the field, while very large animals like moose may be partially butchered in the field because of the difficulty of removing them intact from their habitat. 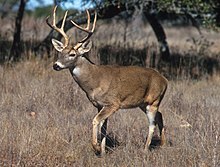 Commercial processors often handle deer taken during deer seasons, sometimes even at supermarket meat counters. Otherwise the hunter handles butchering. The carcass is kept cool to minimize spoilage. Traditionally, game meat used to be hung until "high", i.e. approaching a state of decomposition. The term "gamey" / "gamy" refers to this usually desirable taste (haut goût). However, this adds to the risk of contamination. Small game can be processed essentially intact, after gutting and skinning or defeathering (by species). Small animals are ready for cooking, although they may be disjointed first. Large game must be processed by techniques commonly practiced by commercial butchers. Generally game is cooked in the same ways as farmed meat. Because some game meat is leaner than store-bought beef, overcooking is a common mishap which can be avoided if properly prepared. It is sometimes grilled or cooked longer or by slow cooking or moist-heat methods to make it more tender, since some game tends to be tougher than farm-raised meat. Other methods of tenderizing include marinating as in the dish Hasenpfeffer, cooking in a game pie or as a stew such as Burgoo. The Norwegian Food Safety Authority considers that children, pregnant women, fertile-aged women, and people with high blood pressure should not consume game shot with lead-based ammunition more than once a month. Children who often eat such game might develop a slightly lower IQ, as lead influences the development of the central nervous system. ^ "About Game Meat". 2007-05-19. Archived from the original on 2007-05-19. Retrieved 2011-10-17. ^ "Mattilsynet: – Barn kan få lavere IQ av storvilt" (in Norwegian). NRK.no. Retrieved August 30, 2013.